Welcome to the inaugural issue of CSUN Shine Weekly. I am delighted to introduce you to our latest effort to keep you — the greater university community — updated on the many outstanding programs and events offered here and throughout the region. Read more about CSUN Shine Weekly. CSUN student Talar Alexanian, appointed by Gov. 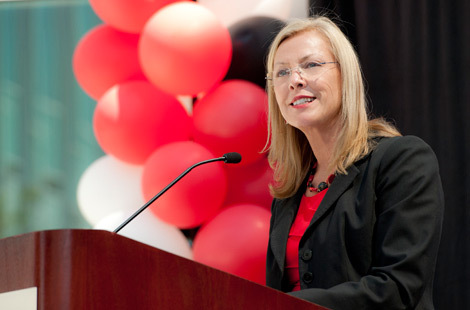 Jerry Brown to the post in July, has begun her two-year stint as a CSU Student Trustee. Read more about Alexanian’s appointment. Faculty, staff, community leaders, students and others attended the two-day event, which was part of a CSUN faculty initiative launched in 2011 in response to concerns about the future of public education. Read more about the symposium. Sat., Nov. 2, 7 p.m. Sun., Nov. 3, 2 p.m. Sun., Nov. 3, 7:30 p.m.
Join multiple CSU campuses for a fun evening of networking and hors d’oeuvres. More than 220 individuals and families traveled from across Southern California to learn, play and network on Oct. 12. Peruse highlights from this year’s annual celebration of CSUN’s early days as San Fernando Valley State College.